Typesetting might sound like an antiquated term. But it is, quite simply, the art and science of arranging text on a page in an attractive and legible manner. It’s a phrase originally used to describe the arrangement of physical, metal type in editorial design. But nowadays, it’s normally used to refer to the arrangement of digital type on screen, using software such as Adobe InDesign. Here, we talk you through what typesetting is and what it isn't, as well as its challenges, and top tips for typesetting. To skip to the tips, click here. Modern typesetting, then, is all about the choices that can be controlled by the designer, including typefaces, sizes, placement and colour. And it should always take into account where the type will eventually live: be that outdoors, indoors, on a desktop or tablet computer, printed, or on a tiny watch screen. All this means that as a junior designer (if you're not sure what one is or how to become one, see this post) your first forays into typesetting for a real client can be quite a challenge. Michele Stocks, who promoted from junior designer to designer at Nelson Bostock Unlimited in 2017, recalls her initial experiences. “It started off being very difficult to choose the right typefaces,” she recalls. Thankfully, though, she soon got the hang of it. “You start to get to know what can work and what doesn’t, and quite quickly I found I knew what I was doing,” she says. Ultimately, it was practice that helped her improve, as well as looking at a lot of different types of inspiration. “There are no real shortcuts: it just takes experience to get it right,” she says. Maya Walters, a creative artworker who previously worked at Hogarth Worldwide, recalls that one of the biggest challenges she faced early on in her career was dealing with multiple client guidelines. 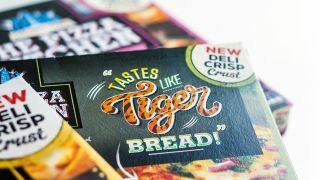 “Having a large list of clients, each with a wide variety of fonts and typefaces, meant a steep learning curve,” she explains. And that’s an important point, because typesetting isn’t something you ever completely master, but something you should strive to develop and improve throughout your career. Not doing so may adversely affect your career prospects, and Tonge stresses that it’s not always the juniors in a studio who have the worst typesetting habits. “There’s a roll call of typesetting sins that designers of all ages can commit,” Tonge grimaces. “The obvious ones I’ve spotted over the years include too much shouty CAPITALISATION, stretching type awkwardly to fit a space, and excessive line lengths. Avoiding such pitfalls and progressing your skills involves a combination of creative flair and technical craft, he adds. “It’s relatively easy to teach technical craft: this is often what college courses do, and certainly something juniors should be picking up from seniors and artworkers. Improving your typesetting abilities is a process of learning the rules, then learning to break them. “You need to learn the accepted rules and basics,” says Luke Tonge. The point he’s making is that type can sometimes be a dry subject if all you do is follow the rules. “But it needn’t be, you just need to know how and when to break them,” stresses Tonge. Ultimately, being good at typesetting is indivisible from being good at design, he notes. “At its most distilled, graphic design is words and pictures, plus hopefully an idea. Type is the clothes words wear, which means typesetting is of huge importance when evaluating a designer’s work. For reading matter, Tonge suggests Type Matters! by Jim Williams and Thinking with Type by Ellen Lupton. And if you really want to treat yourself, he adds, The Visual History of Type by Paul McNeil is “the best book on type this year”. This article was originally published in a 2017 edition of Computer Arts, the world's leading graphic design magazine. Subscribe to Computer Arts here.